“A madman is on the loose with a car company, and he intends to use it.” This is but one (Car & Driver Nov. 2009) of the many quotes one reads nowadays about Ferdinand Piëch’s ambitions, one of Ferdinand Porsche’s grandsons, who, having retired as Chairman and CEO of Volkswagen Group, still sits on its and also Porsche’s Supervisory Board and wields enormous influence. Why do we care? In the context of 917 history it is worth remembering that it was largely that man’s drive forty years ago that fast-tracked the Porsche 917—one of the most iconic racecars ever—from sketch to prototype in an unheard of short seven months (or ten, depending on how you count). There is no shortage of interesting books about this car. What makes this one stand out is that it is written by a former race mechanic who knows every nut and bolt on the car. Connect the dots: The “PMM” on the Impressum page stands for Peter Morgan Media. 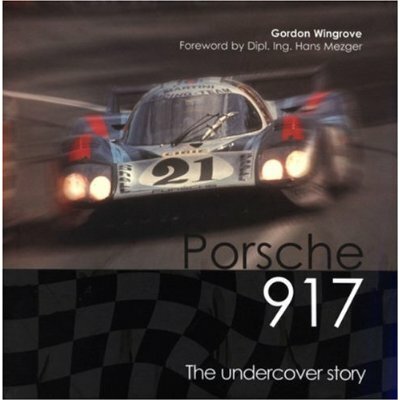 As an author Morgan has himself made significant contributions to the Porsche literature (for the 917 see especially his The Winning Formula, 1999). 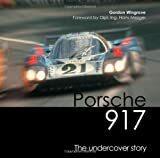 His newest book is an autobiography of Porsche’s excellent engineer Hans Mezger (Porsche Story: Hans Mezger, May 2010) who wrote the foreword to Wingrove’s book. Gordon Wingrove worked as a race engineer for Porsche’s de facto works team and official development partner, John Wyer’s JWA Gulf Team, during the 917’s glory years. (There were two other “official” teams: Porsche Salzburg, under the control of members of the Porsche family and Martini Racing.) JWA engineer John Horsmann was instrumental in turning the 917’s disappointing 1969 inaugural season around by figuring out the right compromise between downforce and drag. Wingrove’s hands-on experience and technical background give unique depth to this book. He covers the whole design and development process, dialing the clock back to 1963 to put the genesis of the 917 into proper context. Considering how much has already been published about the 917 it is remarkable that this book, thanks to support by the Porsche Historical Archive, contains quite a few never before seen engineering documents and photos. The Porsche Museum even made its 917L available for in-depth study. The book reproduces a number of memos and letters, several translated in full, and also many quotes and anecdotes that could only have been gathered by someone who was in the trenches. It does not include the Can-Am cars, i.e. the 1972/73 seasons. The person who has never sat in a racecar will get a kick out of the “Cockpit” chapter. 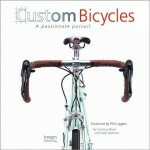 It details the location of every switch and gauge, how to get in and out of the car, how the seat and trim would feel to the driver, how he would thread his feet into the bulkhead to reach the pedals, what the angles of view are, etc.—if this book had “scratch and sniff” tabs it’d be like being there! A final chapter, “917 in Competition,” explains how data acquisition was done and how race set-ups were arrived at. Appended are the 1969–71 ICM results and very detailed specs for the 1969 and the 1970/71 cars. The index is sufficient but riddled with typos and typesetting glitches. Throughout the book, most of the German Umlauts are missing and the spellings are such that you shouldn’t want to place any bets on them. The last sentence in the book—“Today is raceday and the real battle will be fought . . .” is where most other 917 books begin.